The Steering Group behind a campaign to save an iconic church building from ruin have teamed up with pupils from Castlehead High School, Paisley to launch a “Buy a Brick” project, which they hope will help raise up to £50,000 for their cause. The 100 Days to Save Coats Memorial campaign, which launched on 1 February 2019 intends to raise £1.5m to save Paisley’s Coats Memorial Church from closing its doors. Students from Castlehead High School are lending their time and skills to create 500 engraved plaques which will be available to the public to buy for £100 each. The plaques will be mounted on the entrance wall within the Church Building where they will stay, commemorating the many people who donated their time and money to save this architectural treasure. Ian Henderson, Coats Memorial Steering Group member said: “I am proud to be in a position to work with the students from Castlehead High School on this campaign. Coats Memorial is a church that was created to enhance our community. Thousands of people have passed through its doors to celebrate life’s biggest events and we hope it can continue to serve as community space for everyone to enjoy. The campaign has already raised over £34,000 in just 27 days. The “Buy a Brick” project is one of many initiatives that the Steering Group have planned in order to make the fundraising goal a reality. 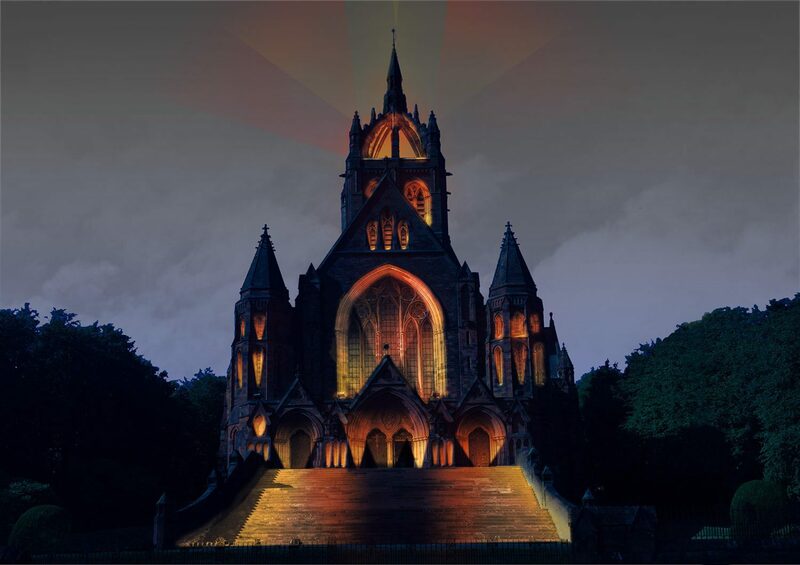 Coats Memorial is open to the public every Saturday from 12noon until 4pm for the duration of the campaign. Picture caption: Left to Right is David Anderson Head Technical Faculty at Castlehead High School, Ian Henderson, Lewis Abercrombie (Pupil), Tony Fitzpatrick, Ross Chawk (Pupil) , Martin Macdonald Head Teacher at Castlehead High School. Photography fans are being encouraged to share their favourite snaps of Paisley’s unique architecture for a Story Map that tells the story of the town through its rich built heritage. The Story Map will capture a visual record of historic properties within Paisley Town Centre Conservation Area. Pupils and community groups are being asked to share their photos, memories and comments on buildings in the town they either have links with or simply admire and have a chance to have them added to the Story Map. The map will also share knowledge about local heritage. The Story Map will go on to be used as a public online resource where people can view and continue to contribute to the story capturing the town’s built environment as time goes on. Local primary school pupils and community groups will attend the Story Map launch on Friday 16 March in the UWS atrium, and bring along a digital copy of their image and a comment to accompany it in order to contribute to the map. The event will also launch a new photography competition which will first be trialled with the groups who attend on the day. Two winners will be announced (under 16 year-olds and over 16 year-olds) at the event and the winning photographs will be printed on banners displayed around Paisley Town Centre promoting the TH.CARS2 project. Following the event the competition will then be opened up to the general public to enter. All details about the competition can be found on the TH.CARS2 website. Renfrewshire Council Leader, Cllr Iain Nicolson, said: “Paisley is home to some beautiful buildings and boasts the second highest concentration of listed buildings in Scotland and it’s great to celebrate this. This forms a key part of the Paisley Townscape Heritage and Conservation Area Regeneration Scheme 2 (TH.CARS2) which is funded by Heritage Lottery Fund, Historic Environment Scotland and Renfrewshire Council and will deliver grant opportunities to property owners in a defined area of the town centre for high quality building repairs and shopfront improvements. To find out more about the TH.CARS2 project please visit www.renfrewshire.gov.uk/THCars2 or to find out more about the Story Map please visit:www.renfrewshire.gov.uk/THcars2StoryMap. The spectacular programme has been revealed for this year’s winter events season in Paisley – with Northern Irish rockers Ash set to headline the town’s annual Christmas Lights Switch On. Paisley’s winter events programme will begin with the two-day Halloween Festival on Friday 27 and Saturday 28 October. The special 80’s themed Paisley Fireworks Spectacular will take place on the Saturday 4 November with the ever-popular Christmas Lights Switch On taking place two weeks later on Saturday 18 November. Winter events excitement will extend across Renfrewshire with live music and free family entertainment taking place at Christmas Lights Switch Ons in Renfrew on Saturday 25 November and Johnstone on Saturday 2 December. The annual MG ALBA Scots Trad Music Awards comes to Paisley for the first time ever and will be held at Paisley Town Hall on Saturday 2 December. the spooktacular Halloween Parade through Paisley town centre with a stunning fire monster on a Paisley Chariot, New Orleans style street band Mr Wilson’s Second Liners Band, the Spark! Drummers and much more. a spectacular Fire Garden and Fire Stage at Bridge Street with soundscapes, projections and illuminations to make for a real extravaganza of sight and sound in Abbey Close. a night of music, haunted performers and spooky goings-on with a Halloween Ball at Paisley Town Hall and Friday Fright Night at Paisley Museum, organised by Renfrewshire Leisure. an 80s themed Silent Disco in Paisley Town Hall during the afternoon and broadcast from Clyde One DJs in the evening ahead of the Paisley Fireworks Spectacular at Abbey Close. The famous Reindeer Parade starting and finishing on Paisley High Street before Santa opens his grotto outside the Paisley Centre. a Live Stage with performance by music headliners Ash before Paisley’s festive season is officially marked with the annual Christmas Lights Switch On. FREE FIRST USE Paisley Winter Events package. Lenny Warren / Warren Media 07860 830050 01355 229700 lenny@warrenmedia.co.uk www.warrenmedia.co.uk All images © Warren Media 2017. Free first use only for editorial in connection with the commissioning client’s press-released story. All other rights are reserved. Use in any other context is expressly prohibited without prior permission. 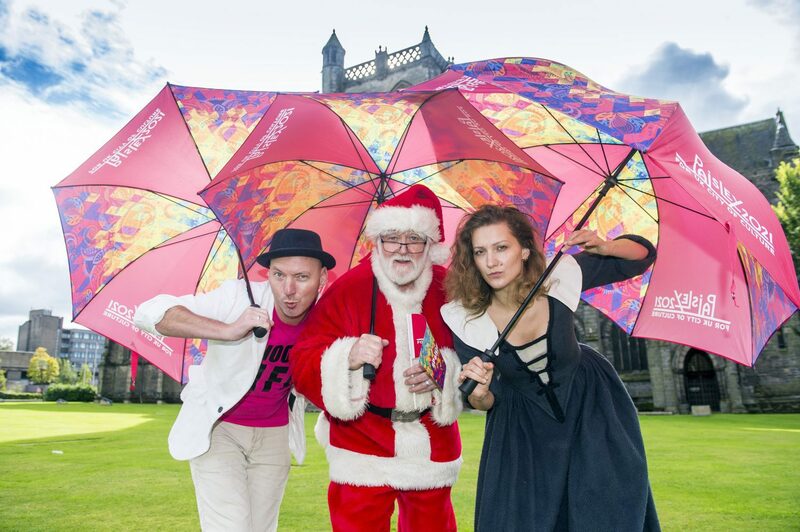 The winter season is part of a wider programme of events in Paisley’s bid for UK City of Culture 2021. Paisley was this summer named as the only Scottish location on the shortlist for the title, alongside Coventry, Stoke, Sunderland and Swansea. The bid is part of a wider push to use Paisley’s unique heritage and cultural story to transform the future of the whole Renfrewshire area, with the final bid document due to be submitted to the UK Government’s Department for Digital, Culture, Media and Sport at the end of the month. Paisley 2021 Bid Director Jean Cameron said: “The Halloween Festival, Fireworks Spectacular and Christmas Lights Switch On are established favourites in the town’s events calendar – and this year Paisley’s winter events programme is even bigger and better than ever. Find out more information at www.paisley2021.co.uk. However, this stunning building needs significant investment to be preserved for future generations. With a dwindling congregation and a lack of essential funds required to maintain this iconic building, it is important that action is taken now. The plans being submitted to Renfrewshire Council, for a change of use for the building, would also allow for the continued use of the church by community groups who are currently based there. The current trustees of the church would hand the building over to a new trust, Coats Memorial Church Paisley Ltd, comprising of local business people who are all keen to ensure this Paisley landmark is preserved. A series of workshops and exhibitions will take place this weekend to celebrate Paisley’s rich built heritage as part of Renfrewshire Council’s Townscape Heritage Conservation Area Regeneration Scheme 2 (TH.CARS 2). During Doors Open Days visitors can view work created by the STAR Project and artist Mandy McIntosh about the life and work of Paisley architect James Steel Maitland – including a short film and a publication ‘Special Concrete’. Create Paisley and local film maker Kevin Cameron will also premiere a short documentary ’Coats Tales – the Town that Coats Built’ about the architectural legacy left to Paisley by the Coats & Clarks families. The activities taking place not only celebrate the town’s heritage but also encourage people to get involved in a range of cultural activities. This is a key part of Paisley’s bid for UK City of Culture 2021. Depute Leader of Renfrewshire Council, Cllr Jim Paterson, said: “Paisley boasts an impressive built heritage and it’s great to see this celebrated during Doors Open Days and through the TH.CARS 2 project. Michael Easson, Grants Manager at HES, said: “The funding awarded through our CARS and Historic Environment Repair Grant to Paisley in the last few years has played a significant role in supporting investment in the City’s built environment. The events at Paisley Arts Centre are not the only activities TH.CARS2 are delivering over the course of the Doors Open Days weekend. An Arty-Archi Sketching and Walking Tour will also take place on 2 September. Heritage expert Alison McClandish leads an architectural sketching tour of Paisley’s Oakshaw area. The tour starts and finishes outside the High St entrance of UWS. Additionally, a traditional building skills demonstration will take place at Abbey Close on 4 and 5 September. The public will be able to see the traditional building skills and crafts which maintain Paisley’s architectural heritage in action. The project is being delivered by TH.CARS2 in partnership with West College Scotland, and with the support of the Glasgow Traditional Building Forum, Scottish Traditional Building Forum, Glasgow City Heritage Trust, National Federation of Roofing Contractors, Stone Federation GB, CITB, Paisley Abbey and Paisley Hammermen Society. Tango dance enthusiasts from across the UK and beyond visited Paisley at the weekend to take part in the first ever Paisley International Tango Festival. The festival which took place at the Coats Memorial Church from Fri 25 – Sun 27 August saw hundreds of people come along to learn new moves and see the experts in action. The event attracted dance fans from across Scotland, England, Germany, Spain and even as far away as Queensland. The Paisley International Tango Festival was funded through Renfrewshire’s Culture, Heritage and Events Fund (CHEF). It also shows the range of cultural activities taking place throughout the town as part of Paisley’s bid for UK City of Culture 2021. Over the course of the weekend local people were invited to come along and take part in free taster tango classes. There was also a series of masterclasses and workshops which took place. The centrepiece to this fantastic event was the Grand Milonga, an Argentinian social dance, on Saturday evening which featured world renowned tango music performer Juango Lopez Vidal and Orquesta Tipica – an international ensemble band working with members of Scotland’s highly regarded McFalls Chamber Orchestra. The event was organised by Drew Moir who has been teaching argentine tango for six years and was delighted by the response to this event which is the first of its kind in the town. The Culture Heritage and Events Fund enabled Drew to bring internationally renowned tango dancers to Paisley to deliver masterclass workshops and inspire the crowds. The instructors travelled to the town from as far afield as New York, Paris, Lyon, Russia and Australia to share their talents. Bid Director for Paisley 2021, Jean Cameron, said: “It’s fantastc to see yet another great festival come to Paisley which attracted such world-class talent to the area as well as hundreds of visitors. Drew is hoping to turn the Paisley International Tango Festival into an annual event following its success. The ‘Porridge Bowl’, unique gargoyles and the home of Robert Burns’ compatriot are just a few of the intriguing sights and locations visitors to Renfrewshire can experience next weekend. Part of a worldwide event with over 50 countries taking part, Renfrewshire Doors Open Days is a celebration of the fantastic architecture and significant history of the region. 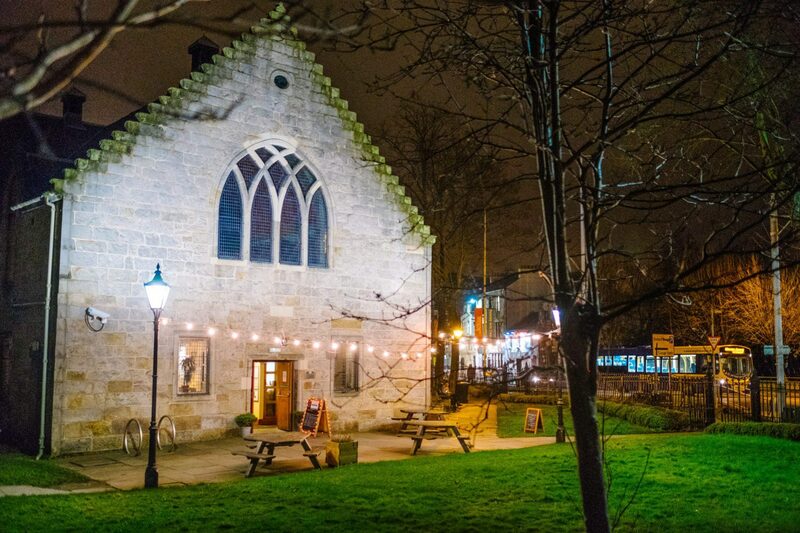 On Saturday 2 and Sunday 3 September, everyone will have the opportunity to experience a weekend of exploration around Renfrewshire as many venues not normally accessible to the public open their doors for a look inside. On Saturday, the home of Robert Tannahill, the ‘Weaver Poet’ who formed a close relationship with Robert Burns, will be open for visitors to see the extraordinary collection of memorabilia on display at what is now the home to one of the oldest Burns Clubs in the world. Visitors will also have the opportunity to look inside the John Neilson Institute which, due to its distinctive roof, is nicknamed the Porridge Bowl and has become a distinct feature of Paisley’s skyline. Sunday will see the Renfrew Victory Baths welcome visitors in on a guided tour of the striking Edwardian swimming pool which was awarded Grade ‘B’ listed status in 1971, while Castle Semple in Lochwinnoch will offer tours of the lookout tower giving visitors to take in the spectacular views of the loch and Garnock Valley. After the news Paisley has been shortlisted for UK City of Culture 2021, its High St location will open its doors on both days to give everyone a chance to find out more about what the bid means for the area, what it could do for you and what’s still to come in the next few months. More than 50 buildings and locations will be open for the public across the weekend ensuring there is something to peak everyone’s interest. Kids can collect their own Doors Open Days passport from participating buildings and Renfrewshire’s libraries which they can fill up over the weekend with stamps. Collecting five stamps will see them rewarded with a certificate and a gift in yet another reason to get involved. Renfrewshire’s Provost Lorraine Cameron will be joining members of the public in exploring the area and can’t wait to see what she discovers. Provost Cameron said: “We are extremely fortunate to have so many beautiful, historic buildings in Renfrewshire but it is not often that we take the time to visit them. “Venues from across the area will open their doors to let us inside next weekend and I can’t wait to take up the opportunity. “I will be at the Council chambers from 10am until midday so I’d be delighted to see you while I’m also looking forward to visiting the Sma’ Shot Cottages as it is always fascinating to hear the volunteers speak on the history of the weavers. The Renfrewshire Doors Open Day programme is available from all Renfrewshire libraries.